This is the basic method for assembling and frosting a four-layer cake. 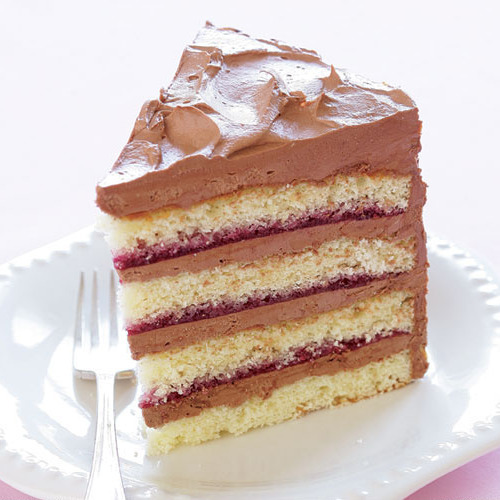 For inspiration, see Vanilla Layer Cake with Chocolate Buttercream & Raspberry Jam, or Orange Marmalade Layer Cake with Grand Marnier Buttercream, or choose your own favorite flavor combinations. 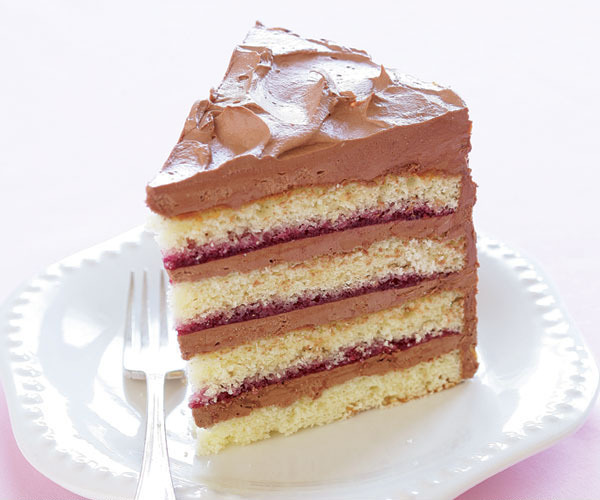 Level the cakes, if necessary, and slice each cake into two layers making a total of four layers of cake. Place the bottom layer on a flat serving platter or a cake stand lined with strips of waxed paper to keep it clean while assembling the cake. Top the layer with a scant 1-1/2 cups buttercream, spreading it evenly with a metal cake spatula almost to the cake’s edge. If your’re using jam between the layers, stir together the jam and liquer in a small bowl. Spread a third of the jam on the next cake layer, then lay it, jam-side down, over the buttercream filling. Repeat with the next two layers. First apply a light coat of frosting (called crumb coating) to seal the cake crumbs in: Spoon about 1/2 cup buttercream into a small bowl. Spread it in a very thin layer over the entire cake with a small metal cake spatula. You should be able to see the cake layers through the icing. Chill the cake for about 20 minutes or until the icing is firm. Spread the icing thickly and evenly over the entire cake with a large metal cake spatula. Don’t worry about getting a smooth, perfect finish; just make sure the cake is completely covered and the frosting is spread uniformly. You shouldn’t be able to see the layers underneath the buttercream. With the back of a teaspoon, smear the icing and pull it upward to form curls and swirls over the entire cake. Cake was pretty good. Pretty easy. Cake was just okay - did not bake high enough for four layers. Chocolate buttercream was divine! love the meringue method because the frosting is not sickly sweet like others can be.